Born Sarah A. Hedrick on January 1, 1827. She married William Gwinn (Born October 31, 1812) around 1846. It's beleived that William and Sarah settled in the Meadow Creek valley around 1849. 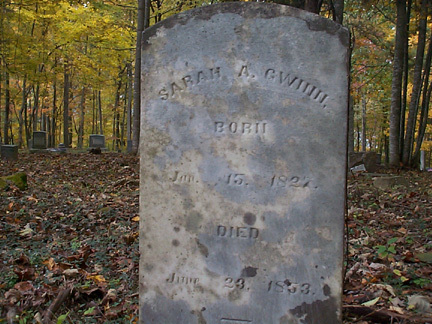 Sarah died on June 23, 1853. William and Sarah had three children. Louisa Jane Gwinn (Born January 14, 1847), Harvey Louis Gwinn ( Born April 29, 1849) and Genety Elizabeth Gwinn (Born November 4, 1851). William Gwinn remarried on December 1, 1853 to Polly Mary Richmond. Information provided by Beckie Rawdon and also by Opal Gwinn Morrison.